When a book opens with our heroes running from a planet, having just been shot at while trying to smuggle a war criminal off world because they’re hard up and need the money, you know you are squarely in space opera land. And there you stay as Captain Jarek Reen and his two companions—one of them a female Sidhe, the other her human lover, and both of them flying assassins with various deadly abilities—steers us between the galaxies to find Aleph, home of the last Sidhe males, to bring back a shiftspace beacon so that the backward planet Serenein can join the rest of humanity. If it sounds like a good old-fashioned space adventure story, that’s because it is. 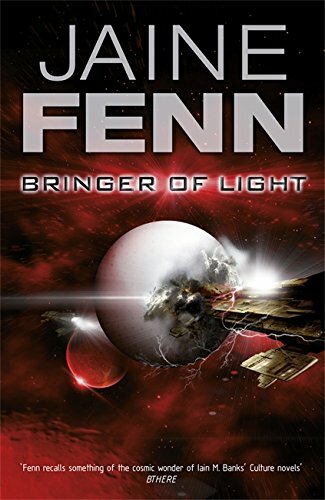 Jaine Fenn is arguably part of the British “new space opera” movement (along with writers such as Peter F. Hamilton and Alastair Reynolds), a group that has led a massive revival of the genre in the past twenty years or so. A part of Ms. Fenn’s Hidden Empire series, this intergalactic saga includes many old favorite tropes—even to the extent of the mysterious and powerful Sidhe females having extensive psychic powers. The Sidhe (named after the Irish magical creatures who lived underground in fairy mounds) are evil females who once had the human race enslaved, and oddly pedantic and squabbling males (we discover in this volume) who once helped humanity gain its freedom but now hide out in a separate galaxy and practice a kind of feudalism. None of this is really clear until you are well into the book. Similarly, Jarek and his two assassin friends have complex and relevant histories that might take the reader some time to come to grips with. And then there is the planet Serenein, backward and primitive, cut off from the rest of humanity, run by a theocracy under the thrall of the Sidhe females, existing as a breeding ground for humans with special magic abilities that the Sidhe need. And Captain Reen happens to be married to the ruler of this world after meeting her in an earlier book—one of the reasons why he is risking a visit to the Sidhe males to help them integrate with the rest of the galaxy. It is a lot of history and a lot of backstory to convey within the current plot. Ms Fenn makes a good job of it, but it does slow down the pace and she does not entirely succeed. Gollancz tells us that Bringer of Light can be read as a standalone novel, but it is the fourth in the series and it does help to have read the others. But don’t worry that the backstory is a little convoluted or that some of the plot devices seem a bit strained (our heroes just happen to be on good terms with a male Sidhe who can negotiate with his fellows to get them the shiftspace beacon they desperately need). The story still romps along at a good pace, and it is helped enormously by Jaine Fenn’s writing. Her characters are nicely drawn and the whole delivery is in a punchy, casual style that suits the story. The “voice” of the book is reminiscent of the comic space operas of Harry Harrison (particularly the Death World series), and that is no bad thing. The contrast between the action in space and that on the almost medieval planet, Serenein, prevents either from growing stale, and the different sets of characters in each setting are sympathetic and convincing. If you like rollicking space adventures, this book will not disappoint. If you like a bit of preindustrial fantasy blended in, you will definitely love Bringer of Light. But you should seriously consider reading all four books in the series rather than just this one. Graham Storrs is a former research scientist and software designer who now writes science fiction. He is the author of TimeSplash, a near-future sci-fi thriller (Lyrical Press).